Rebecca Camhi Gallery is pleased to present the second solo show by Clare Woods entitled White Holes. Clare Woods was born in Southampton in 1972 and lives and works in London and Herefordshire. She studied at Bath College of Art, Bath and Goldsmith’s College, London. She has shown extensively in Europe and the U.S.A. and her works belong to important public and private collections. Woods was commissioned by the Contemporary Art Society Consultancy for a major commission at the Olympic Park, London in 2010. 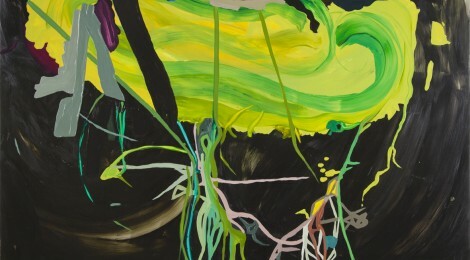 Clare Woods’ work mainly refers to landscapes, a strong part of the British culture. Her paintings describe places that are intimate and desolate at the same time. Although they are abstract, they are somehow psychologically charged. Over the recent years she has become interested in rocks and sculpture which resemble heads. During the preparation for the exhibition at The Hepworth Wakefield in 2011, Woods visited West Yorkshire to see Brimham Rocks and Adel and within their towering natural forms, she discovered forms that were actually more human than landscape. As a result, her more recent paintings looked corporeal with a particular interest in the human head. However, Woods is not interested in portraiture, rather she is concerned with sculptural heads formed by other artists such as Louise Bourgeois, Henry Moore etc. It is perhaps no surprise to learn that Woods studied sculpture befor becoming a painter and that she is instinctively drawn to it still now. Apart from this significant shift in subject matter, she started using oil paint and her work has become more gestural and expressive. To make all her different styles of work, Clare Woods starts with photographs, either images that she has taken herself or which she finds in books. She therefore does not paint what is directly before her and that allows her to work with an intuitive instinct for abstraction. Woods aims to create a mental distance between her and her subject matter. Conversely, this intellectual detachment actually allows Woods to engage more closely with her subjects. It enables her to get to the very essence of the things she paints, allowing her an objectivity, and ultimately gives her work its greatest strength. In her show, entitled White Holes, at Rebecca Camhi gallery, six paintings will be exhibited: a combination of the aforementioned thematic perspectives, a continuum of her older and recent work.